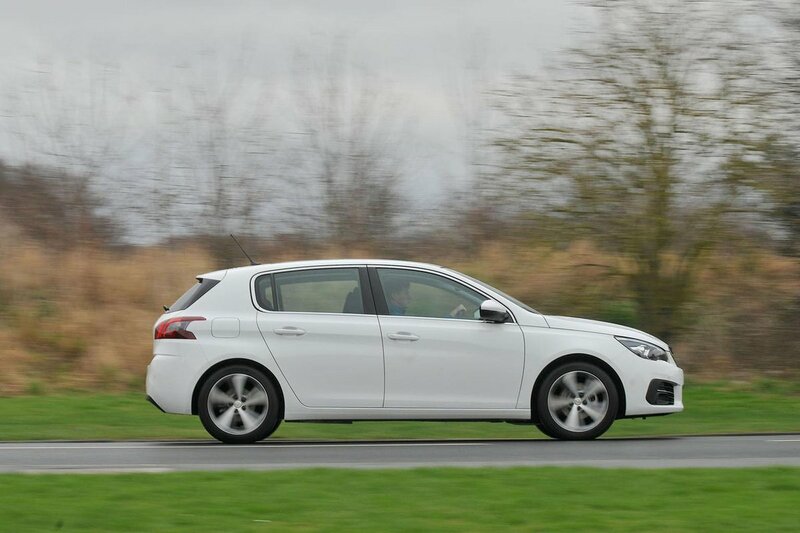 Peugeot 308 Performance, Engine, Ride, Handling | What Car? Our favourite diesel engine is the 128bhp 1.5-litre engine, which was recently introduced to replace the ageing 118bhp 1.6 – a unit that had been available since the car’s launch. The 1.5 is flexible, so you rarely have to rev it hard, and it makes the 308 feel reasonably brisk. It's also more efficient and economical than the previous unit, despite having more grunt. Unsurprisingly, you have to work the entry-level 99bhp 1.6 diesel pretty hard at times, but it doesn’t feel significantly slower than the higher-powered version when you do. The 2.0-litre diesels are the quickest but, given the 1.5 isn’t far behind them, we’d stick with that and save some money up front. The 1.2-litre three-cylinder petrol engines are worth a look, too, if you don’t do lots of miles. The 109bhp unit is decently punchy at low revs and is the pick of the petrols – and our favourite engine of the range. The 129bhp version of the 1.2 feels more urgent and is usefully brisk, but isn’t worth the extra cost. The higher-powered 1.6 petrols are reserved for Peugeot’s GT and GTi models. They’re very strong with their turbochargers spinning, bringing superb performance. Of course, the penalty for this speed is a noticeable thirst for fuel. Sadly, the 308’s ride is a mixed bag. Not only do you hear the suspension thudding over bumps in town driving, but hit a ridge with both front wheels and you’ll feel the car thump, too, and certainly more than in the more sophisticated Volkswagen Golf. As usual, the bigger the alloy wheels, the worse the 308 rides. 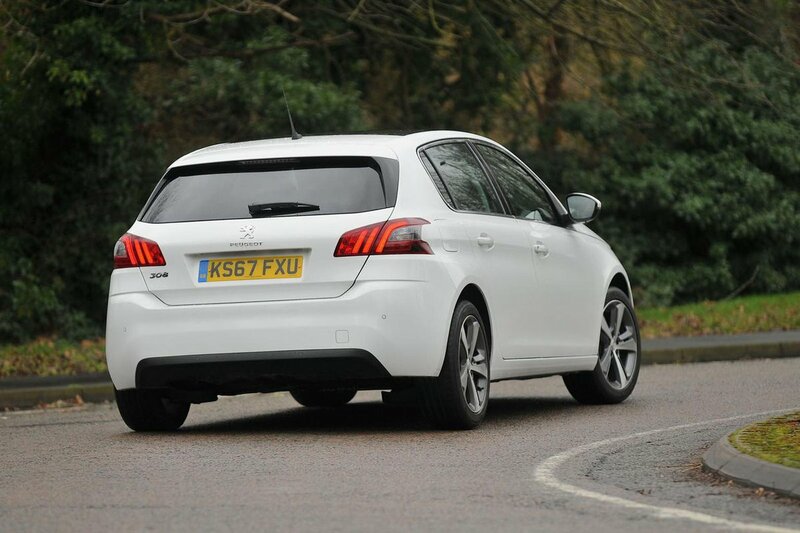 On the motorway, the 308 tends to fidget around as well if the road isn’t dead smooth. There are occasions when it impresses, though; potholes that would set the Skoda Octavia crashing and banging are dealt with reasonably ably by the 308. The 308’s tiny steering wheel (part of Peugeot’s i-Cockpit design) gives it a keenness to turn in to bends, but you wouldn’t describe it as nervous. And the steering is nicely weighted, staying light in town and building resistance the faster you go. There’s not much feel through the wheel, but most of the 308's rivals don't have particularly feelsome steering wheels, either. 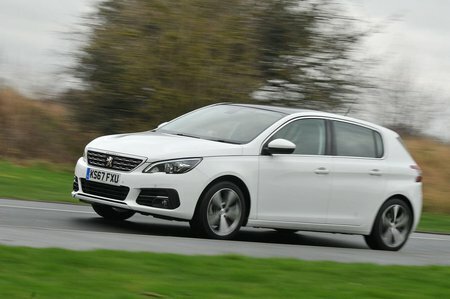 The 308 has plenty of grip and relatively well-tamed body roll, too, but the Golf remains a sharper and more entertaining drive. The 128bhp 1.5 diesel engine stays relatively quiet even when you work it hard, but the 99bhp 1.6 and the 2.0-litre diesels sound noticeably gruffer and transmit more vibration through the pedals. The 1.2-litre turbocharged petrols are the most hushed engines in the line-up, remaining calm and quiet at all times. You have to put up with some wind noise at motorway speeds, while the manual gearbox has a vague action and the auto ’box can be slow to respond. The 308 pedal weights aren’t as consistent as a Golf’s or Octavia’s, either.